A new production plant for Ronchi Mario Spa in Gessate. After the expansions occurred in 1996 and 2000, this year the Company inaugurates the new plant situated in an area of about 20.000 square meters, of which 4.000 are covered. The new building will meet the demand of an always increasing international customer base. 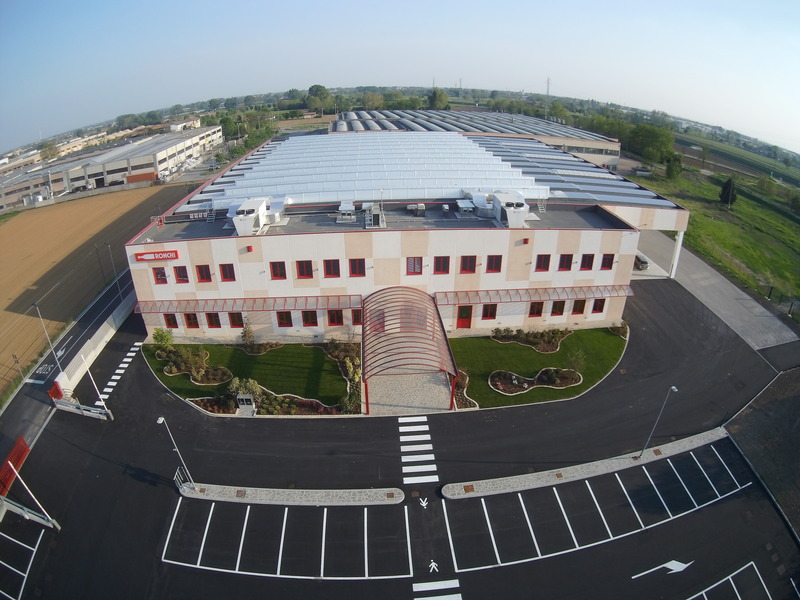 The new production building, pride of the Ronchi Family, incorporates all the features of a “Zero Emission Building”, and it’s powered by alternative renewable energies. The photovoltaic system produces enough electrical energy to totally cover the energy need, replacing the traditional methane gas system. The roof rainwater is collected into a storage tank to irrigate the green areas and wash the courts, saving potable water. The heating system fueled by the photovoltaic technology doesn’t create pollution. While cutting down on the air pollution, the new “Zero Emission Building” represents a sustainable industrial development system and will create at least 70 new jobs, confirming the continuous growth of the Company and the high attention to its employees and to the creation of a healthy work environment.